Chevrolet’s take on the numbers states by leasing a new Spark, you can save as much as $150 a month in fuel expenditures, even after paying for all the electricity the car consumes as you commute. First, it specifies a low mileage lease, but all that means is it's used for an average daily commute – about 29 miles per day. Second it specifies the Spark EV 1LT as the leased car – it has an MSRP of $27,495 and the full savings would be helped by taking advantage of the $7,500 Federal tax credit. Of course, you have to make enough to owe that much tax to take advantage of it fully. A nifty bonus in California gets Spark EV owners a pass into the HOV lanes – cutting time and kilowatts off your commute. Some other states offer local tax incentives, but again you can only deduct as much as you owe. Nevertheless, what Chevrolet is suggesting is that it is possible to drive the 2014 Spark EV for three years paying $199 per month, with $999 due at signing, which includes a security deposit, but does not cover title, property tax, license or dealer fees. Of course you still have to pay for insurance, but you’d only spend about a dollar a day to charge it – maybe a little more depending upon where you live. If you spend $200 a month commuting in a gasoline powered car, you really could save $150 monthly with a leased Chevy Spark EV. Remarkably the Spark has an EPA estimated range of 82 miles on a full charge plus an equivalent of 119 MPG in city or highway driving. Guaranteed for eight years or 100,000 miles, like other Chevy battery packs, the 21 kWh lithium ion battery in the Spark will debut the SAE approved DC Fast Charging combo option, allowing the recharge of up to 80 percent of its capacity in 20 minutes at compatible Fast Charging stations. A full charge can be achieved with a 240V power supply overnight, specifically within seven hours. OnStar provides the Spark EV smart phone app throughout the duration of the three-year lease, allowing stress-free management and oversight of the car’s charge level at any given time. Also of note, according to Chevrolet, the 2014 Spark EV is one of the first electric vehicles capable of multiple Fast Charges in a single day – which would greatly enhance traditional EV range, given the availability of fast charging stations. Another aspect of the vehicles connectivity comes in the Spark’s Waypoint tab, integrated into the RemoteLink app, that aids in plotting a route along compatible charging stations, should charging en route be required to reach an intended destination. The OnStar service also includes Directions and Connections, Automatic Crash Response, stolen vehicle assistance and navigation. 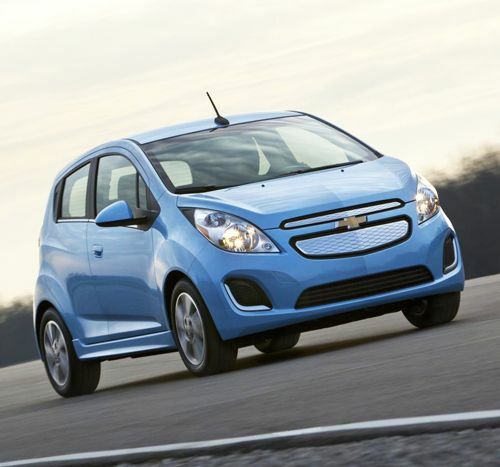 The 2014 Chevy Spark EV 1LT will be available in California and Oregon during mid-June this year.